Tanja's Cafe Restaurant at Wellington Point strives to create the best food possible, and always use fresh, natural, chemical and preservative free ingredients. Where possible certified organic ingredients are also used. Tanja's has gluten free choices marked on its menus. Cooked gluten free breakfasts are available. In addition, there is an all day menu, dinner menu and late menu. See the website link above for more details. If requested, the chefs are also happy to adapt other menu selections to gluten free where possible. Several varieties of cake are available. The perfect partner to Bruno Rossi Moccopan coffee or choose from a selection of teas. Tanja's Cafe Restaurant is the ideal venue for special occasions, business meetings (private meeting room available), and there are regular in-house functions. 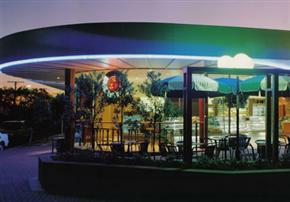 Enjoy outdoor seating to take in Queensland's pleasant climate.